When Jerry’s neighbor Martin goes into a coma, Jerry gets involved with his girlfriend Gina but is worried about anyone finding out. Only problem is that Newman of all people becomes aware of the affair and plans to bring Martin up to speed when he comes out of the coma. Luckily, Jerry is able to buy Newman’s silence with a Drake’s Coffee Cake. Gina: It’s Martine. I think he’s dying. He tried to kill himself with pills. Jerry: In my pajamas? I better get my robe. Gina: We don’t have enough time. Jerry: It’ll take two seconds. Gina: There is no time. Jerry: We don’t have two seconds? Gina: All right. Go ahead. Jerry: Nah. I’ll just wear the pajamas. Gina: Will you just get it. Jerry: Nah, I’ll go get the robe. Jerry: That’s not too bad. It’s not like a Sunny von Bulow comma. The doctor said he should snap out of it anytime. Gina: You know why he did this? Because I told him it was over. I did not want to see him anymore. Gina: I could not stand it another minute. Yesterday he turned over a man’s hot dog stand because he thought the man was looking at me. And then after he saw you in the hall. Ach, he was crazy with jealousy. Jerry: Oh boy, did he say anything about me? Gina: He does not like you. And all indications are he does not like Drake’s Coffee Cake. Gina: He was screaming about it all night. How it’s too sweet and it falls apart when you eat it. Jerry: I’m sorry if I caused any trouble. I was just being friendly. Gina: No, I have thought about you many times. Have you thought about me? Jerry: Are you sure he can’t hear anything? . . .MARTIN, MARTIN. Gina: I wish he was not in a coma. I wish he was dead. I wish I could pull the plug out from him. Jerry: I, would, I would wait on that. I know how you feel but. Juries today, you never know how they’re going to look at a thing like this. Gina: I saw you looking at your watch. You want to leave? Go ahead. Jerry: No, I just wanted to see what time it was. Gina: Are you afraid of him? Jerry: Is this the proper venue? Gina: You don’t want to? Jerry: No, no, I want to. I, I very much want to. I, I desire to. I, I pine to. Gina: Then kiss me right in front of him. Jerry: I can’t. What if he wakes up? Gina: A man is lying here unconscious and you’re afraid of him? What kind of a man are you? Jerry: A man who respects a good comma. If it was one of those in and out comas, maybe. But when a guy’s got a coma going like this … you don’t want to mess with it. Gina: I do not like your toothbrush. There are no bristles. Jerry: You can say what you want about me but I’ll be damned if I’m going to stand here while you insult my toothbrush. Gina: It is too small for someone with such a big mouth [kisses Kerry]. Let me ask you. What will you do if Martine wakes up? Run away like a mouse? Jerry: No, more like the Three Stooges at the end of every movie. Jerry: Well, they’re three kind of funny looking guys and they hit each other a lot. Jerry: Well, I don’t really know where The Stooges are right now but if I locate them you will be the first to know. Gina: Come, you walk me to a cab. 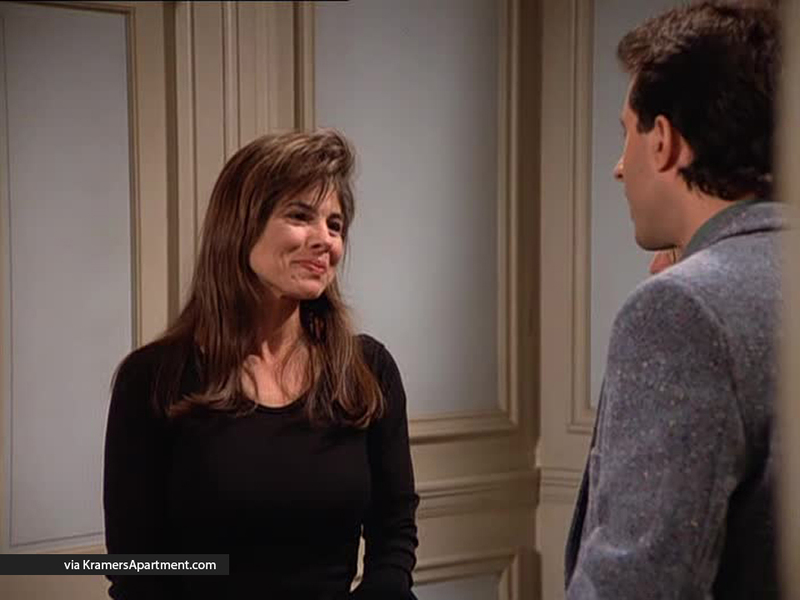 Jerry: Well, uh, I uh, I don’t want you to get upset or anything but uh, with Martin and all, well maybe it’s not such a good idea for us to be seen together in the building, because, you know, he had a lot of friends here. Gina: You’re still afraid. You are not a man. Jerry: Well then what are all those ties and sport jackets doing in my closet? Jerry: Yeah, all right. All right.